A jade burial suit sewn with gold brims discovered 50 years ago at the Mausoleum of Liu Sheng, an aristocrat of the Western Han Dynasty (202 BC to 8 AD), has gone on display at the National Museum of China in Beijing. It is part of a collection of 722 relics, including bronze swords gilded with gold, oil lamp holders, food utensils, wine pots and cups as well as ladies' jewelry, being exhibited to commemorate the 50th anniversary of the archaeological discoveries made in the mausoleum located between Beijing and Shijiazhuang, capital of north China's Hebei province. The significant status of Liu, of genuine royal blood, is an invaluable asset for archaeologists and historians to gain first-hand evidence in studying the history of one of China's most glorious dynasties. Living through the reigning of Emperor Jing (188 - 141 BC) and Emperor Wu (156 - 87 BC), Liu witnessed the rise and full blooming of the Western Han Dynasty in terms of its economic, social, diplomatic and military achievements. And this is fully reflected in the extravagance of his mausoleum. A visitor to the exhibition surnamed Yu said: "I have been stunned by the exhibition in regard to the intact and well-preserved relics discovered 50 years ago at the mausoleum. 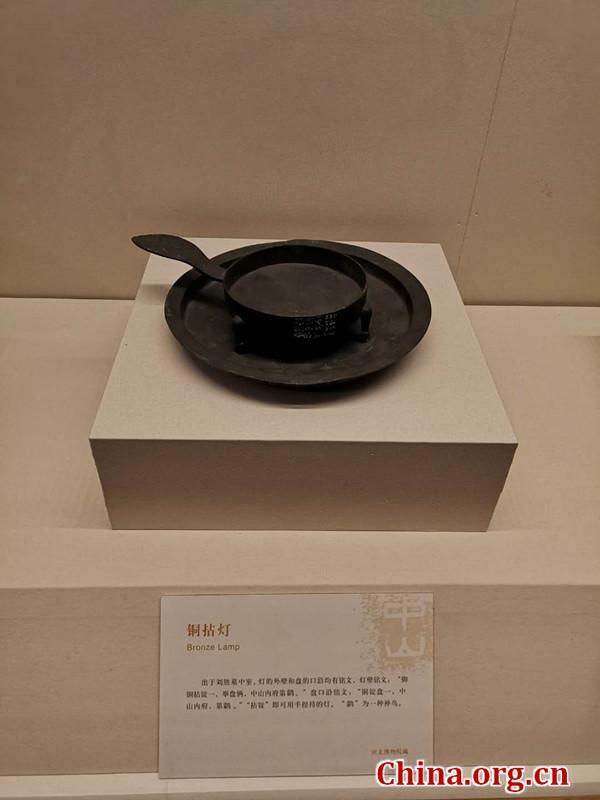 The technologies, such as, the production of those utensils, were so exquisite in such a remote period, which has convinced me the greatness of the Chinese civilization." The exhibition, with an entry fee of 30 yuan (US$4.42) per person, will continue in the No.9 showroom till March 28, 2019. A collection of 722 relics, including famous jade clothing, discovered 50 years ago from a vassal's mausoleum in Hebei province has gone on display in Beijing.